It’s another sunny day in the Caribbean. Everything is how it should be, how the pictures show you in the travel magazines and people tell you after their dream holidays. There are no clouds in the sky, the vegetation is rich and colourful; the Mango trees provide you with a natural and healthy breakfast. You put on your swim shorts and flip flops, get the car keys and sunscreen. You’re ready to go. The air is warm and rich, and through the open window it flows. The palm trees look majestic on the roadside. You close in to the beach, but something is off. The idyllic setting is broken by a clenching stench, like if a big invisible sewer is hidden somewhere in there. The car takes a left, starts to progress up the cliff and the beach appears in the wing mirror. It’s not white and shiny anymore, and the water is the opposite of crystal clear. Where’s the Caribbean turquoise trademark? Instead of the ocean blue, a big brownish mantle covers the beach. That mantle, formed by seaweed, is the origin of the striking smell. It’s not only ugly and smelly, it’s a danger for the people and the environment. 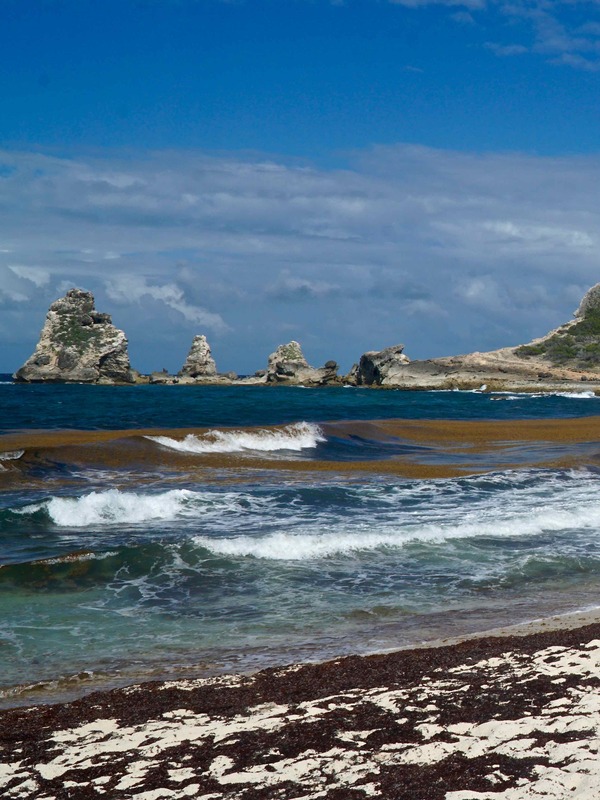 What covers the beautiful beaches in Guadeloupe, a small island in the French Antilles, is an algae species known as Sargassum. This species shouldn’t be in the hot waters of the Caribbean, but mysterious factors have made this phenomenon a recurrent problem since 2011. Scientists are still figuring out why this is happening, but they already know the issues posed to the local population and fauna. I’ve been surfing in Le Petit Havre, a gorgeous beach close to my friend’s house, for a week now. 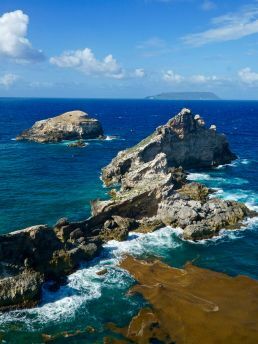 Due to its location and the ocean currents, the Sargassum doesn’t strike as bad. It’s still present, floating through the lefts rising from the reef bottom. On a bad day, they tangle on your leash and you have to swim through a bunch of them to go on the lineup. They even become itchy after a long period of contact with the skin. There are several risks when this algae accumulate in the sea and also once they reach the shore. Because they tangle together and form big brownish floating masses that stay captured by currents, certain reefs of the Caribbean Sea lose the sunlight that brings them to life. Sea turtles, for example, have been reported dead after stumbling with these foreign invaders. 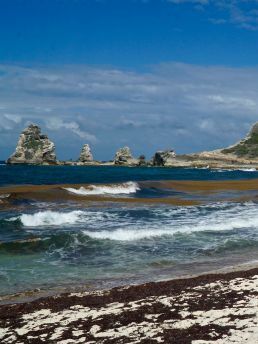 Once inland, when it washes ashore, the Sargassum starts a process of fertilization that causes the most visible consequences to the population. “The algae will ferment for a week or so, depending on the weather. During that time, a mix of three gases will be released: about half is methane, which is non-toxic and odorless, the other half is ammoniac, which is also non-toxic, and 0.6% is hydrogen sulfide. H2S is very poisonous, even in small quantities. 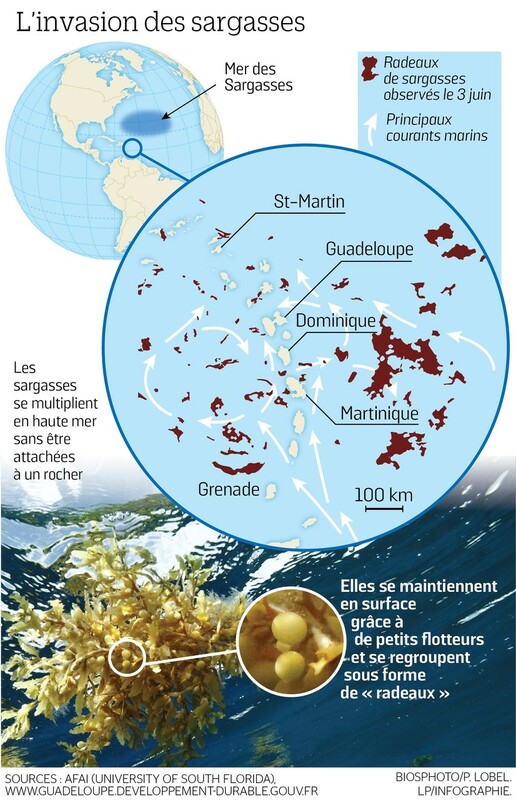 It attacks the eyes and nose, and stinks of rotten egg”, explains Didier Roux, of the Health and Environment department at the Agence Régionale de la Santé (ARS) in Guadeloupe, to Ocean71 magazine. The smell and the brownish seaweed concentration that kills the views are just a warning of a bigger environmental issue. The phenomenon is believed to have its origins in the Amazon River estuary, where the heavy industry polluted waters clash with the Atlantic ocean. This discharge serves as the main nutrient for the growth of the Sargassum seaweed, a species only believed to exist in the Sargasso Sea. The problem then swims away from Brazil to the Caribbean by the natural course of the currents, and the governments either can’t face the size of the issue or directly don’t want to put resources in it. The later is the case of the French Antilles and Guadeloupe. Paris doesn’t want to recognize the algae arrivals as natural disaster, which would force a straightforward intervention. In Sainte-Anne, the main tourist spot in Guadeloupe, the houses in front of the sea boast of beautiful views and idyllic hammocks to take a siesta under the palmtrees. Walking around town though one cannot stand the foul smell of the Sargassum that amasses in the beaches. In the island, more than 50 cases of hospitalization have been registered due to the effects of toxic gas inhalation. It’s not only disgusting, it’s actually toxic. The tourist focused economy, obviously, has also taken a hit in the last years. 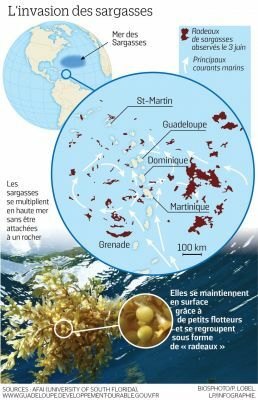 “An expert report updated in March 2017 by the French National Health Security Agency (ANSES) notes that in Guadeloupe, in 2015, several restaurants closed during the last seaweed invasion and that hotels have lost up to 50% of their annual turnover”, reports Repeating Islands, a website specialized in Caribbean news. I wake up early in the morning, one last time, to say goodbye to the waves in Petit-Havre. It’s a good session among friends and seaweed, still present like every other day. After a quick shower and feeling rejuvenated by the ocean water, I head to the airport. I’m flying back to Europe via Martinique, another island in the region. Through the small plane windows, I gaze at the ocean and see lines and more lines of dark green and brown colour. A lot of them. The seaweed just keeps coming, and through a bird’s eye perspective, seems a task too big to be tackled only by the islanders. Who’s gonna solve this problem? P.S. 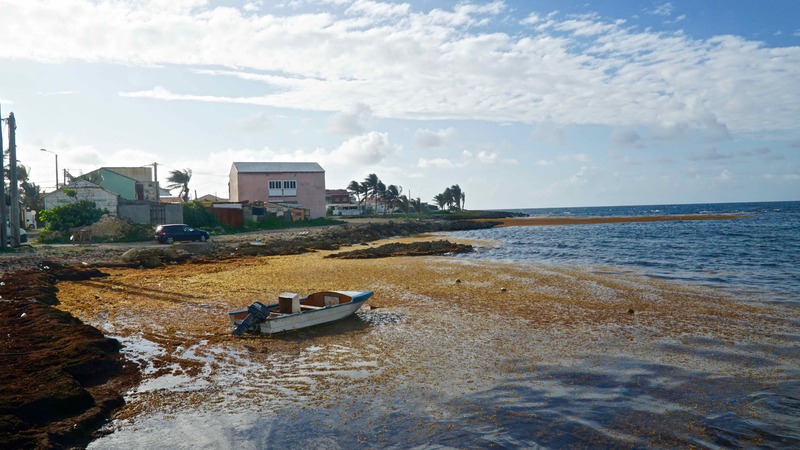 The Sargassum seaweed personally didn’t affect my experience in the island. In a lot of the beaches, their presence is not as bad as it sounds. There are still good spots to enjoy the Caribbean lifestyle without smelling the rotten egg odour. In my opinion, this disaster shouldn’t kill the economy. Visiting Guadeloupe is still worth it, like the rest of the French Antilles and the Caribbean, I’m positive. Maybe you’ll skip some beaches, stay less in a certain town. It’s also good to see it in person and understand what human activity is doing to our ocean and to our world.